Note: for this you will need the file “Steven Slate Drums 4\SSD4_to_Aerodrums.iom” included in the zip file linked to above. You may wish to place this in the “SSD4Library\IOMaps” folder if you want to keep it with your other SSD4 mappings. Click the “Construct Kit” button located in the panel on the left. Then click the “View Kit” button. If the “Use Mapping:” button at the bottom reads “from Kit Preset” then click it to change it to “from Map Converter”. Next click on the “Map Converter” button followed by the “Load Conversion” button. Choose the “SSD4_to_Aerodrums.iom” file to use the Aerodrums MIDI mapping. 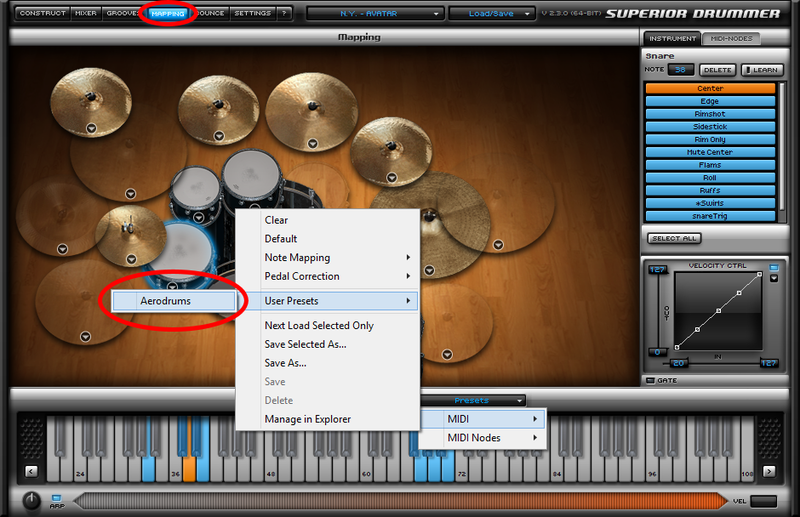 Note: for this you will need the file “Superior Drummer 2\Aerodrums” included in the zip file linked to above. To load the preset inside SD2, click the “Mapping” button at the top. 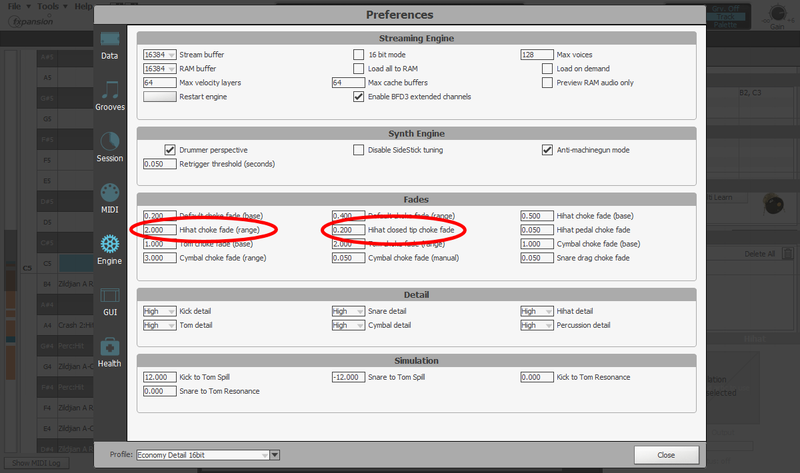 Then click on “Presets” just above the piano and choose MIDI → User Presets → Aerodrums. 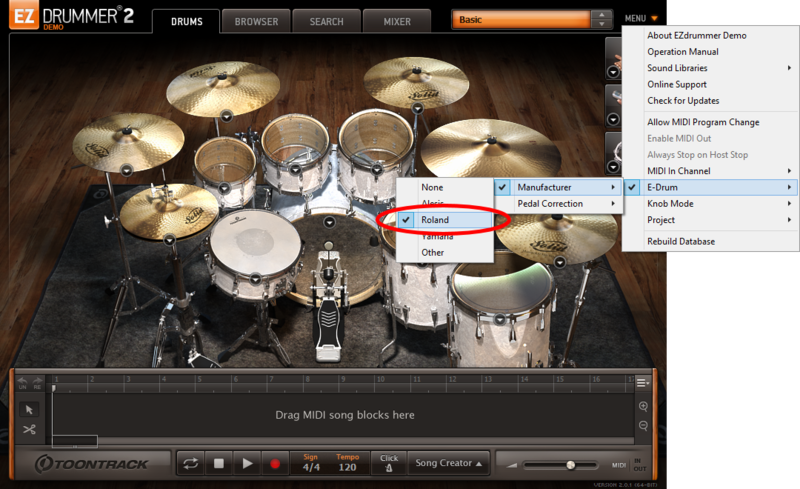 EZdrummer 2 does not provide the ability to define a custom MIDI mapping. Instead a number of preset mappings are included. 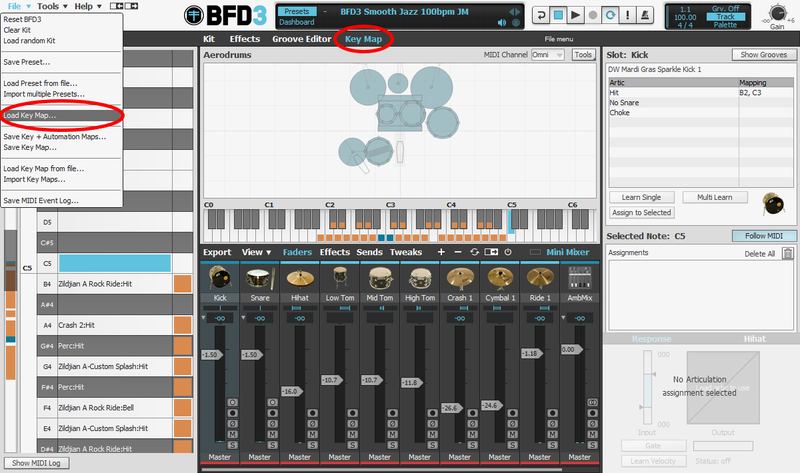 Note: for this you will need the files “BFD3\Aerodrums.bfd3map” and “BFD3\Aerodrums.png” included in the zip file linked to above. 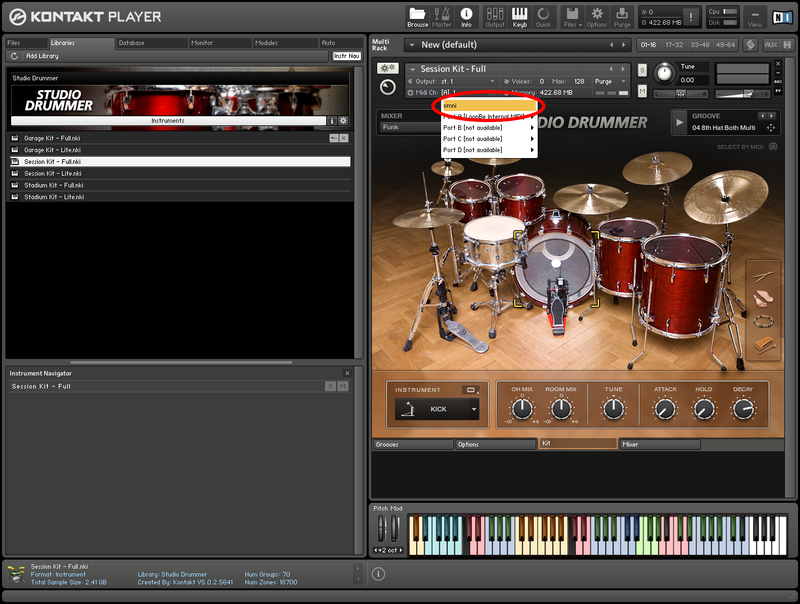 To load the Aerodrums mapping, click on “Key Map” just above the picture of the drum kit. Then, from the “File” menu in the top-left corner, choose “Load Key Map…”. You should see an Aerodrums preset in the list. Double-click on it to load it. 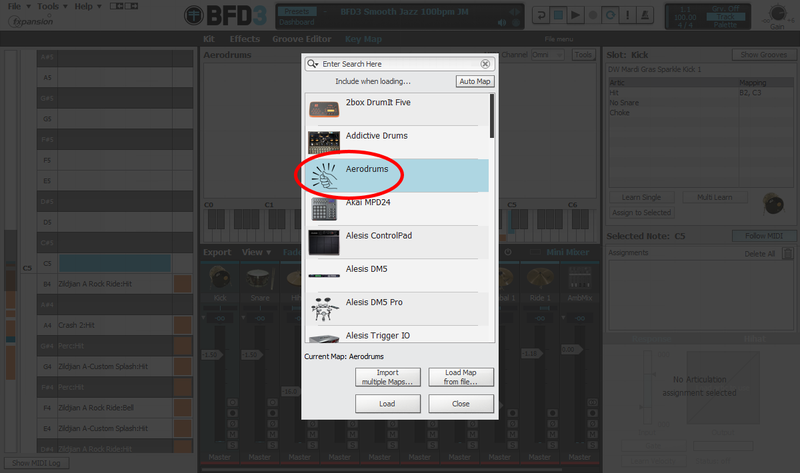 For best results, some of the BFD3 preferences should be edited to prevent hi-hats being faded out too early. Click on the “Tools” menu at the top and choose “Show Preferences”. Then click on the “Engine” tab at the left of the preferences window. The value labelled “Hihat closed tip choke fade” should be increased from the default value of 0.05 to 0.2. The value labelled “Hihat choke fade (range)” should be increased from the default of 0.5 to 2.0. Note: for this you will need the three files located in the “Studio Drummer” folder of the zip file linked to above. Warning: copying these files will overwrite any MIDI mapping presets you may have previously saved within Studio Drummer! If the above folder doesn’t already exist you can force its creation by first saving any custom preset within Studio Drummer. 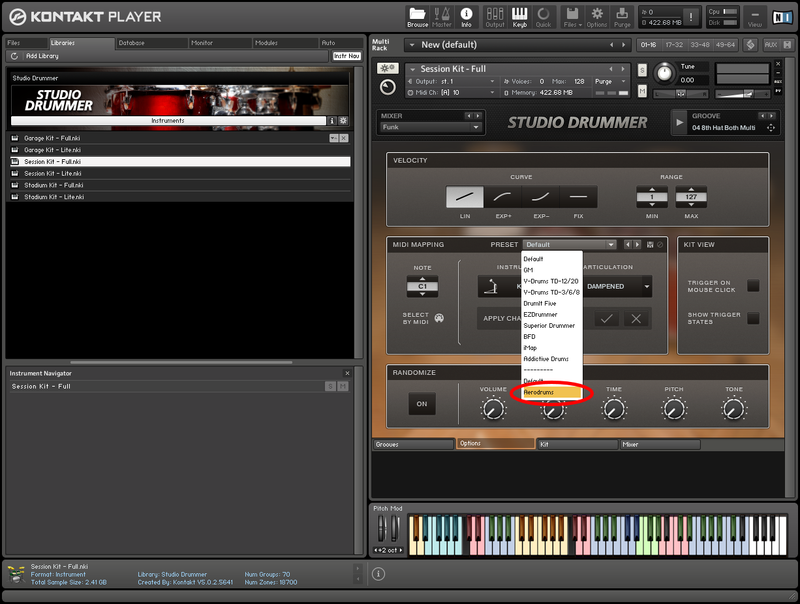 To use Studio Drummer with Aerodrums, click on “Midi Ch:” just above the image of the drum kit and choose “omni” to tell Kontakt to accept MIDI inputs from all ports/channels. 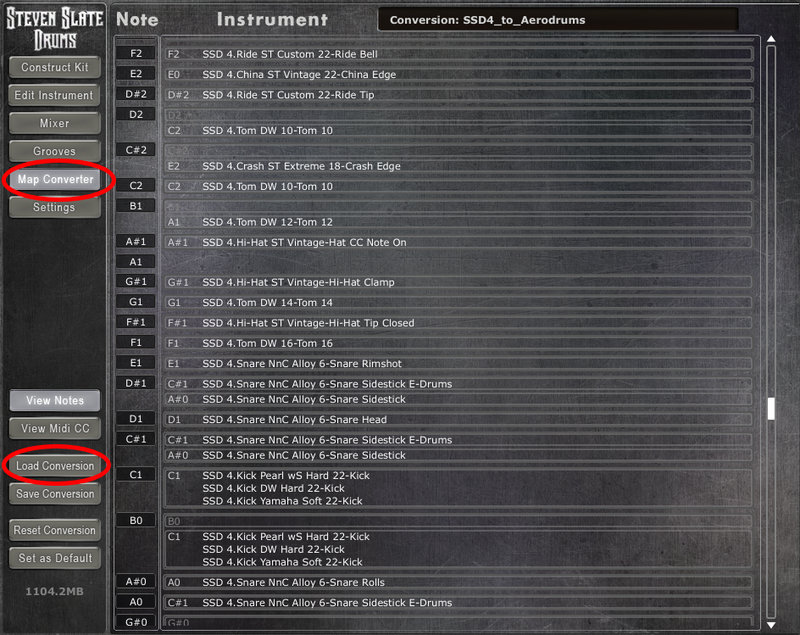 Then click on the “Options” tab near the bottom and in the “MIDI Mapping” panel change the active preset to “Aerodrums”. 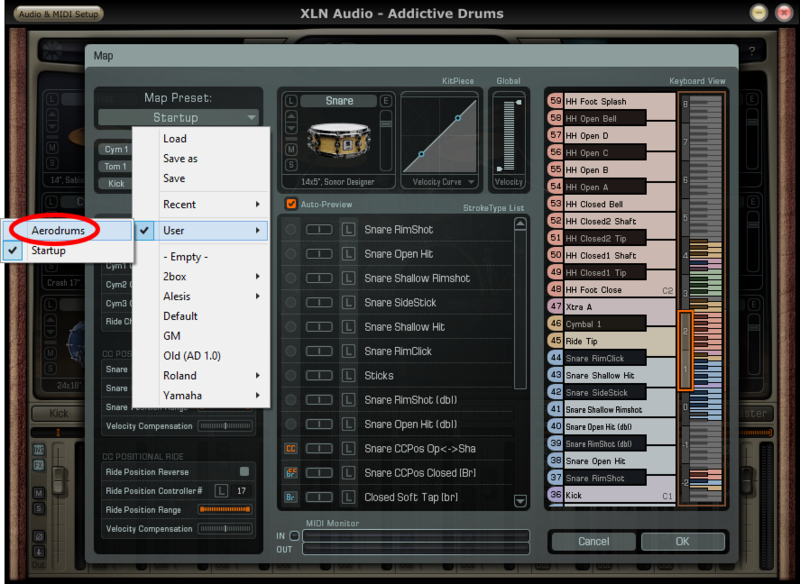 Note: for this you will need the file “Addictive Drums\Aerodrums.ADMap” included in the zip file linked to above. 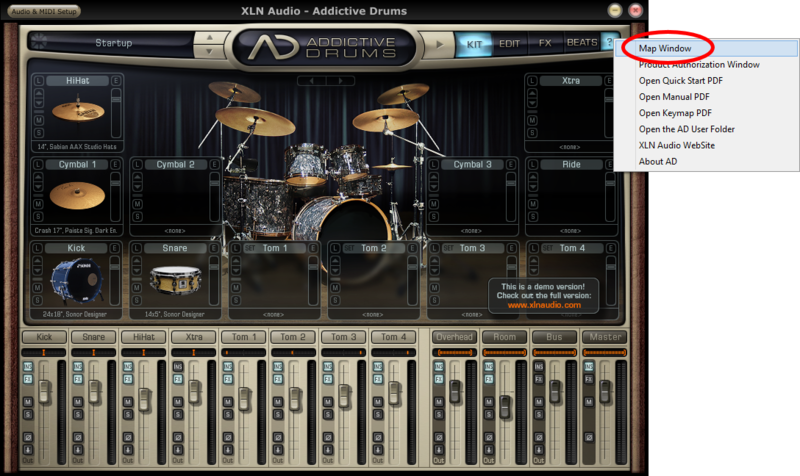 If you are using Addictive Drums 2, simply drag and drop the mapping file onto the Addictive Drums 2 interface and it will load automatically. At this point you can re-save it under a new name if you wish to avoid dragging and dropping it each time. To use the mapping, click the “?” button in top-right corner, then choose “Map Window”. 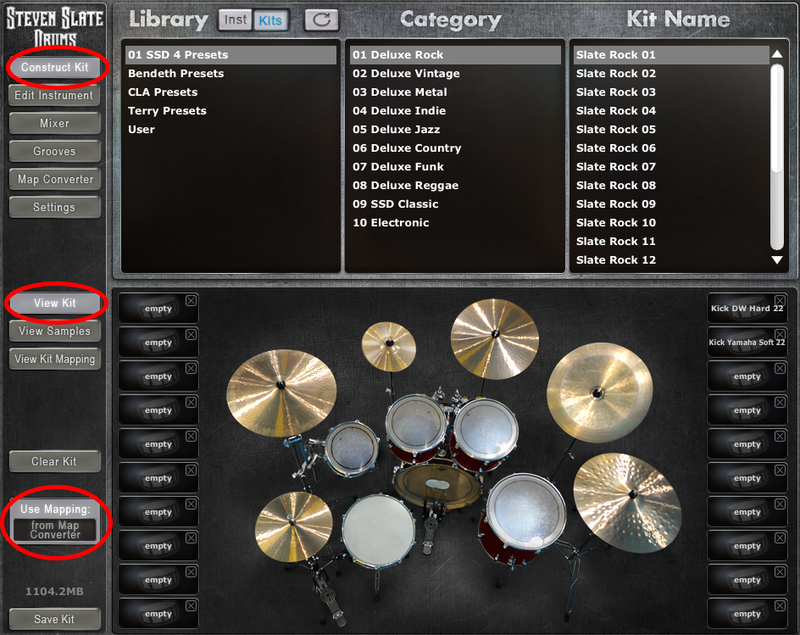 From here, click the “Map Preset” drop-down and select User → Aerodrums.